The invention of water flosser fulfilled the dental floss industry by some regard. If you have a doubt about that, I will help clear things out. Brushing the teeth with a sonic or manual toothbrush can only manage to remove some plaque from between your teeth. They manage to clean the outer surface only. The leftover plaque can be the source of tooth decay, gum diseases and bad breath. The best water flosser will make your gums healthier and your teeth brighter with adjustable pressure settings and specially designed tips. The best water flossers are effective in cleaning up to 99.99% plaque, oral biofilms and food crumbs from between the teeth. Plus, it has been proven time and again and water flossing is 50% more effective than string flossing. 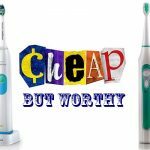 In this article, I throw another ploy at devising how the best water flossers can take a lot of burden off the toothbrush and clean every part of the mouth with added care. To help if narrow down for you, I will first start with the 5 best picks of mine. Check them out and reclaim your glittering smile. 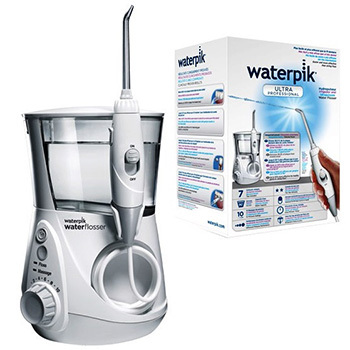 The Aquarius flosser from Waterpik brings to you a totally new way to flossing. It brings you whiter teeth and better gums with just a minute of daily action. You get better pressure performance with both the massage and floss modes. 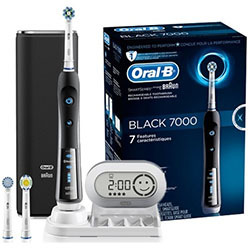 There are ten pressure settings, 90 seconds of water capacity and 7 flossing tips. You will definitely like the contemporary design on the Aquarius flosser. The on/off has been placed on the handle so you can reach it easily. The good thing about the Aquarius flosser is you can use it even if you have braces, crowns or implants on. It also works well with peridontal pockets. These features do not affect the plaque control mechanism of the device in any manner. It removes plaque from your teeth with equal zeal. Even if the plaque is stuck between the braces, you can easily floss it out with proper washing. Pauses briefly at the 30 and 60 second breaks. Very loud for a home-based flosser. 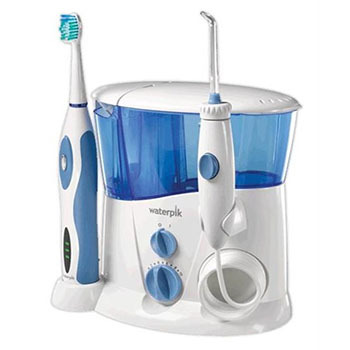 The Complete Care from Waterpik is a device that does both brushing and flossing seamlessly for you. It promises you healthier gums in just 14 days and delivers well on that. 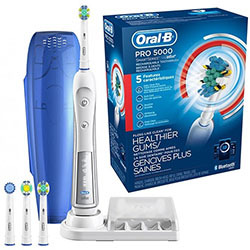 The toothbrush uses a never-before combination of pulsations and water pressure that help it clean deep between the teeth and below the gumline. These are typically the areas where regular flossing finds it very difficult to reach. The standard Waterpik hard-sided travel case comes included with the pack. Using the Complete Care is totally easy. All you need to do is fill up the tank with water and point the tip straight to the gum line. If you have sensitive teeth, you may consider adding a mouthwash or filling warm water. You also get a compact brush head that takes of precision cleaning. The standard brush head is what ensures cleaning all round. 2 classic tips with jet, 1 pick pocket tip. Easy floss action with the reservoir. Healthier gums within two weeks. Travel case included in the pack. Deep cleaning action around the gumline. Weak handle hose may pose longevity issues. 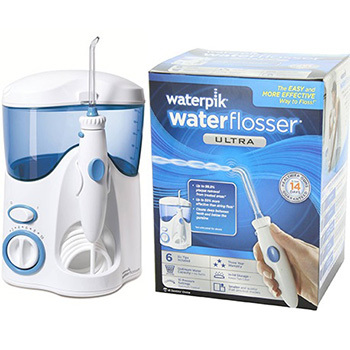 The Ultra Flosser from Waterpik is made of plastic. You will like how artfully tacky it feels to hold it in the hand. It is designed in the USA and manufactured in China, and a manufacturer does a pretty honest job telling you about that up front. 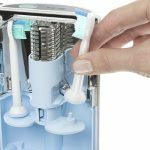 The jet of the Water Flosser is capable of producing twice the cleaning results that you typically achieve with flossing. The advanced controls drive water at a pressure of 1200 pulses every minute inside your mouth. There is significant usage advantage for those wearing braces, having diabetes or with gum disease. You will not go wrong with the selection of the 6 different tips since each of them is individually colored. You may rinse the device thoroughly when its use is over. This prevents any calcification of sugary material in the hose and reservoir. But the Ultra Flosser does not replace flossing complete, like some of the better-equipped models do. 10 different pressure settings for better flossing. Smaller footprint makes it easier to carry. Does not completely replace flossing. The WP-260 comes with some benefits unique to kids. It presents more effective and a far more fun way for ‘small-time’ flossing. 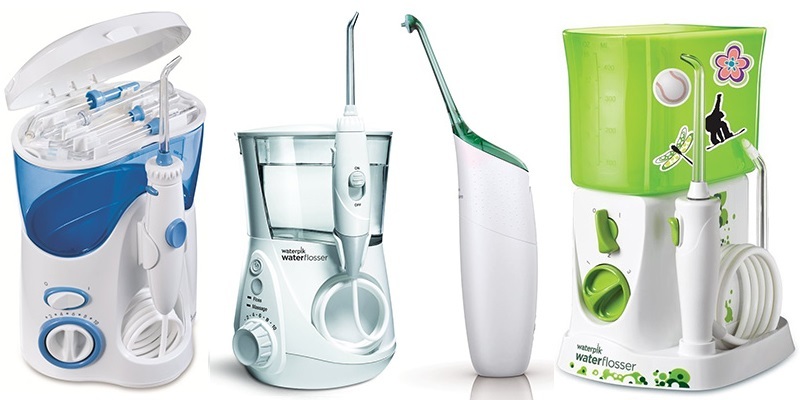 If your child is aged above 6, you can definitely choose the WP-260 as their daily floss. The design of the unit is very simple and one that kids can easily use once they get the hang of it. 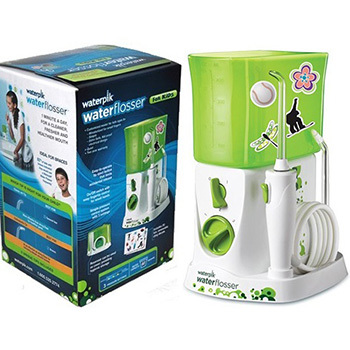 The water flosser has a very safely engineered design that is proven to assist kids in operation. The fingertip control function with the pressure sensor and the off/on switch is fairly simple. The reservoir can also be used as a covering guard when cleaning the unit. You get the classic jet tip for daily cleaning and there is an additional orthodontic tip that helps with braces. There are many decals that your kid can use to personalize the kit. 20 removable decals for personalization. Essential flossing for kids with braces. Healthier gums than general dental floss. Does not replace flossing per say. An open reservoir may attract debris. 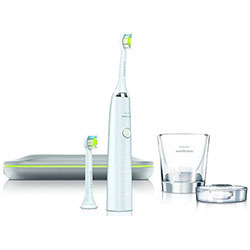 The Sonicare HX8332/11 comes with patented Triple Burst technique that can clean your mouth with a simple button control. The toothbrush has been proven as effective for gum health as string floss. 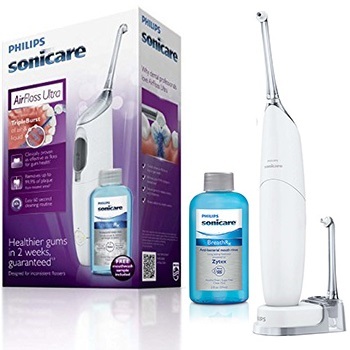 It helps you clean up to 99.9% plaque from every treated area compared to a manual toothbrush. All you need to do is fill up the reservoir, point it at the gumline and clean. You achieve most things in just a minute of that routine. The company guarantees healthier gums in just 14 days. 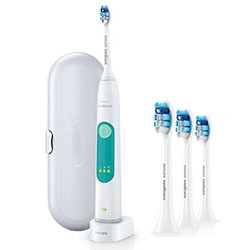 The Sonicare HX8332/11 is quite small and handy to use. 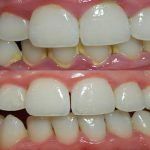 It just takes a minute of your time and you can combine it with regular brushing to achieve inter dental cleaning that regular brushing can not achieve. You can hope to find even better results if you use it with antimicrobial mouthwash. But the general daily use can simply be addressed with water. You may use warm water if you have sensitive teeth. Effective floss for better gum health. Removes 2x more plaque than manual toothbrushes. Better gums in 14 days. Works well with orthodontics, veneers and implants. Not the most convenient button. Water flosser or dental floss! Which one is best option? You can use a cordless water flosser twice a day. But you cannot go for dental floss every day. It is a process that requires you to visit the dentist or the orthodontist.It is a very deep process that thoroughly cleanses plaque between teeth and right below the gumline. So the results are more visible. On the flip side, water flossing can be done daily at home. You spend one or two minutes flossing teeth and if the flosser is good enough, you will never grow enough to go for a dental floss session! What characteristic should you look for when buying a water flosser? There are several types of water flossers available. Some have the potential to eliminate the need for professional cleaning, while others are just good at regular cleaning between flossing sessions.Some are simply the best when you travelling.You will have to choose the one that suits you better. There are between 3 to 15 pressure setting levels in water flossers of all kinds. While you will not need all these pressure settings together, it is good to have a variety. The high speeds will play catch up once there is an irregularity in use. The number of tips becomes an important consideration if you wear braces or use orthodontics. There are also some tips that are specially designed to drive fluid between the teeth and facilitate inter dental cleaning. These are the ones you should be going for. Is it effective with plaque removal? It should be. Since the flossing action is also combined with general brushing, the flosser should be able to remove plaque from spaces where regular brushing cannot remove plaque. The better models also help remove plaque stuck between braces and teeth. Does it improve gum health? It is the job of flossing to take care of gum health. Typically, a good model should improve gum health on and off in less than two weeks. While that does not happen all the time, the device should add to your gum health with regular use. The water capacity of the flosser comes into play when analyzing the force at which water is dispensed inside the mouth. You should ideally look for a device that has a big reservoir where clean (or treated) water can be stored. Which brand is best in this industry? This is a real no-brainer. With the most products in the category, Waterpik takes away the prize pretty seamlessly. It has manufactured a number of water flossers and some of the best belong to its lineage. Even the champion of our comparative review belongs to Waterpik. We are revealing that kind another minute. Waterpik couples upper performance with the right kind of equipment. They always include attachments that are effective and make some difference to the cleaning and flossing. Why is water flosser the best choice for braces? Braces are tooth supportive structures that cannot be removed for a while once they are installed. A water flosser is an ideal product for cleaning braces because it takes care of plaque removal from difficult corners created by braces. The flosser drives in fluid to the spaces between teeth and braces and in the joints of the braces, where more plaque naturally accumulates. Good water flossers have separate tips for brace cleaning, ones that you can use even for your kids. The cordless water flossers are the ones that provide greater movement and can expectedly be charged for use. You will have to carry out operations during the time the flosser holds charge. That also helps you floss closer to the bathroom, if not exactly inside it. The corded flossers do not allow maneuverability as their cordless counterparts do. But you can always take depend on them for powerful service. And you do not have to wait for them to charge. So the choice really boils down to which option you like better. 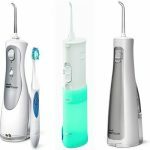 How often to use water flosser? Dentists recommend flossing of teeth at least once in two weeks. But using a water flosser at home is a completely different routine. You can use a water flosser for a few minutes every day. For those who wear braces or orthodontics, you can even use the flosser twice a day. Gum health slowly starts improving over a period of two weeks once you start flossing for a minute or two daily. But you should not go overboard with the frequency use as it may cause gum problems in the long run. Just follow your orthodontist’s instructions on this. Can a water flosser remove tartar? Yes, a water flosser can remove tartar. But the results might not be as significant as regular flossing. Since tartar is the hardened form of plaque, it no longer remains harmless. The tartar slowly starts to decay on your teeth and you will not have an option but to do away with it. A water flosser can just be the help you need when trying to remove well-settled tartar. Using a cleaning solution with water is a great way to deal with tartar when flossing. Just make sure you do not add too much of the solution, lest it should generate a burn sensation. 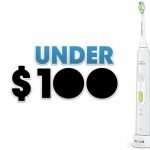 The Aquarius Water Flosser is among those products you would consider spending an extra $20 on. Much like electric toothbrushes, the flosser gives you a short timer alarm after 30 and 60 seconds. The hydro-pulse movement is the best for massaging gums and it does not get any better at least in this category. The power cord is longer than any other flosser and its aesthetics are as pleasant as the morning. So on the whole, you cannot go much on the negative if you are flossing with the Aquaris Water Flosser. You do not choose a flosser without weighing all your options for the day. Follow your heart about the rest and you shall have the one that suits you best.